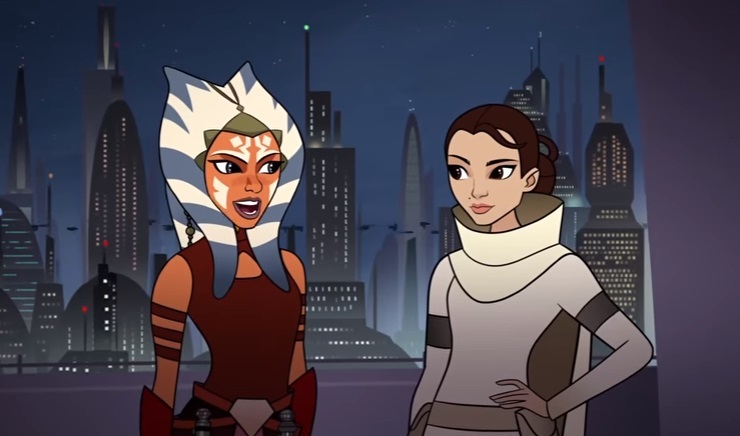 For fans of Star Wars The Clone Wars, it’s great to see additional material from that era, especially on-screen. And all the more so with one of the more popular characters from the show, Ahsoka Tano. In two recent animated shorts from Star Wars Forces of Destiny, one released last week, and one this past weekend, we get to see Ahsoka in action. 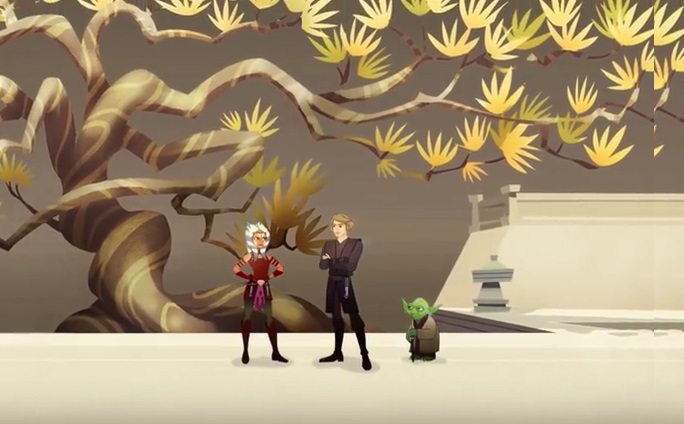 The first of these, “The Padawan Path“, lasts 3:03 and shows her on route to the Jedi Temple to meet up with Anakin, as well as Yoda, for a ceremony to receive her padawan braid. While it’s unclear how significant or important it is, Anakin says that it is important to her. Along the way to this ceremony, however, she sees a mother and son in trouble on account of a malfunctioning droid on the loose in Coruscant. Ahsoka goes out of her way and Force-pushes some material to crash into the droid. 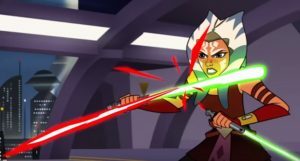 The droid then simply gets up and recognizes her as a threat, whereupon she then ignites her lightsabers and goes after it, slicing into its legs and then slicing water piping, causing water to go on to the droid, making it fully stop. It’s unclear as to exactly when this short is to have taken place (Pablo Hidalgo stated that he did not know), although Wookieepedia identifies it as taking place between the episodes “Hunt for Ziro” and “Heroes on Both Sides” in the third season of Star Wars The Clone Wars. 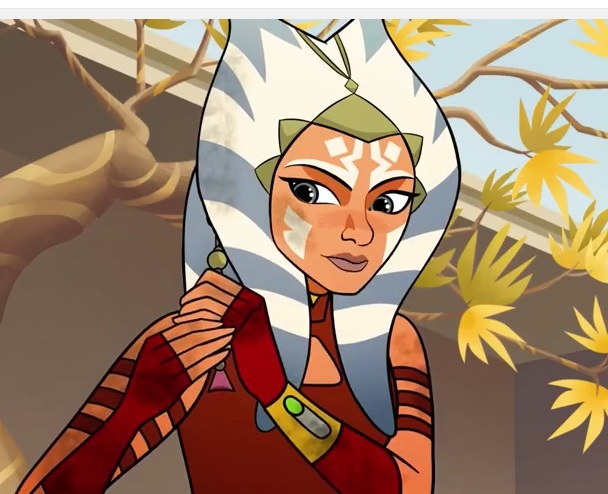 The second Forces of Destiny animated short with Ahsoka, “The Imposter Inside“, is a bit shorter, coming in at 2:18, and shows Ahsoka protecting Padmé Amidala. 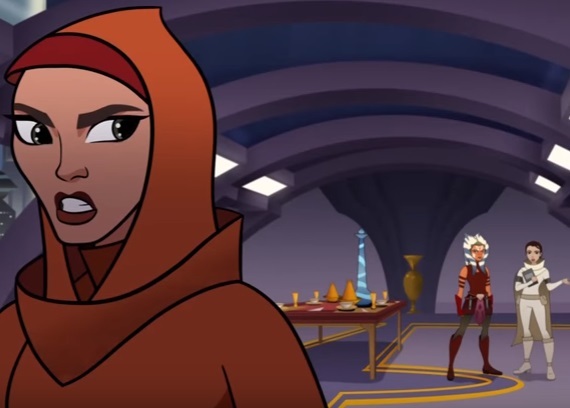 While preparing to host Arthurian delegates, a maidservant is setting up the table and Padmé is speaking with Ahsoka. “Hmm – you’re right,” responds Padmé, “and I was very specific in my instructions.” She then asks the maidservant about it, who then whirls around, taking out a blaster, then shooting at them. 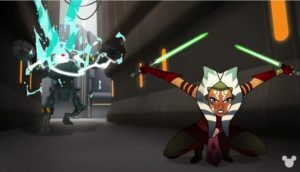 They then get behind a table for cover, with Ahsoka then jumping out and lighting her lightsabers to deflect the shots. 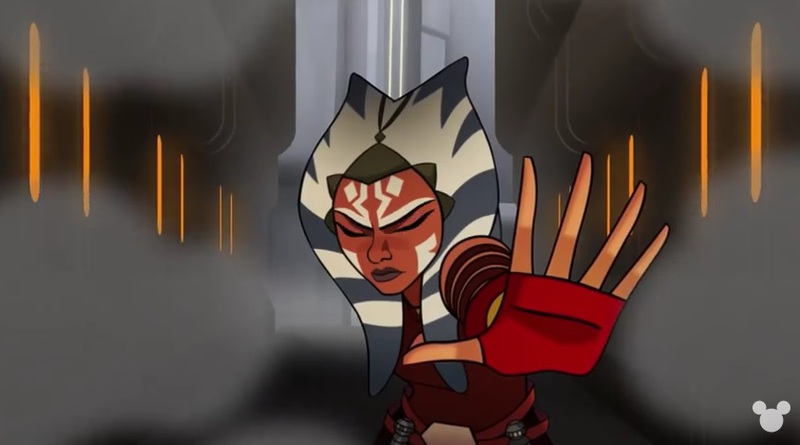 Ultimately, Ahsoka gets one of the shots to ricochet back at the supposed maidservant, who then is revealed to be Cato Parasitti, a Clawdite bounty huntress. Parasitti then gets up and runs away from her, but not before Padmé clubs her with a piece of pottery, preventing her departure. 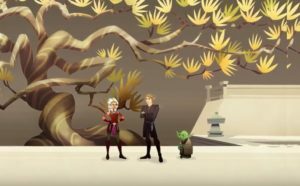 As to the timing of this animated short, according to Leland Chee, it takes place sometime amidst seasons 3-5 of Star Wars The Clone Wars. 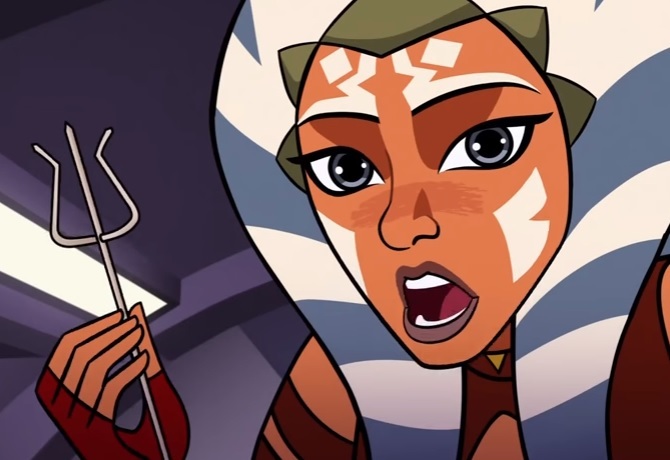 It was really a pleasure to see Ahsoka in these two animated shorts, especially in the familiar era of the Clone Wars. While we have seen Forces of Destiny shorts of Rey in The Force Awakens and Princess Leia in the original trilogy, it is neat to see some Clone Wars-era material here, as well. 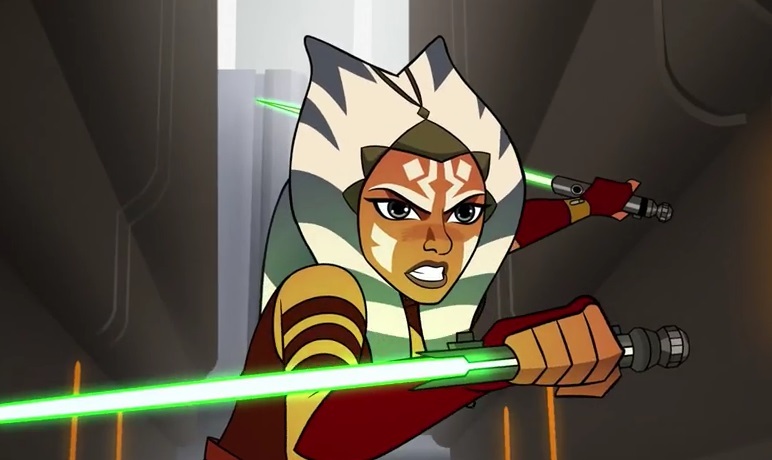 I hope we get to see more Ahsoka in the future.